Shaken, not stirred, the ROGZ Utility Range remains remarkably innovative and fresh with its latest addition. Made with the same durable materials and padded mesh found in your sports shoes, with a highly reflective stitching and piping for improved night time visibility, the ergonomically-designed Boomerang-shaped Fast-Fit harnesses bring new meaning to a harness that you slip onto your pooch in the blink of an eye. Step your dog into the harness, pull either side up and clip neatly and swiftly over the back of your dog. Fasten your lead to the joined rings at the back by the clip and you're ready for the next adventurous walk with your dog! 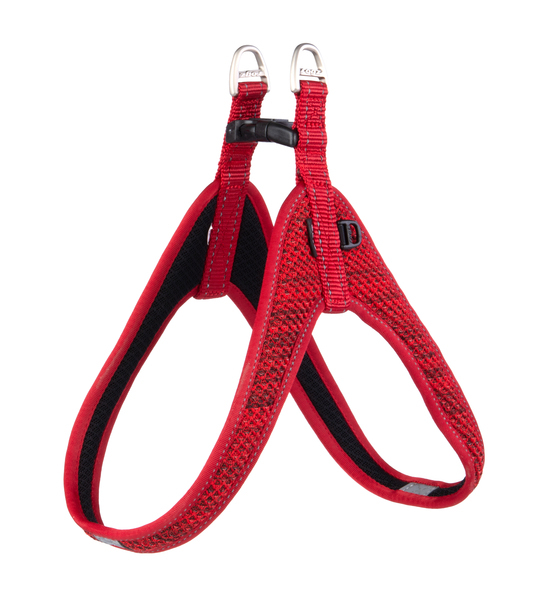 The Fast Fit Harness is available in 7 sizes and 5 colors. The Large fits a dog's chest girth of 25in. The latest addition to our dog harness range is the ergonomically designed Fast-Fit Harness for small to medium dogs. A streamline boomerang design makes for a fast and easy fit and prevents chafing under the legs and matting of hair. Engineered to allow a full range of movement, pressure is transferred from the dog’s neck to its chest. Constructed with durable webbing and breathable mesh, the Fast-Fit Harness is padded for extra support and is comfortable. This harness is non-adjustable and comes in a range of sizes to suite the weight or girth of your dog. Added features include reflective stitching and an added ID-tag attachment point. Please carefully measure your dogs chest size before purchasing so as not to be disappointed. Our Fast-Fit Harness is the perfect harness solution for a fast paced lifestyle! Available in 5 colors and 7 sizes.